Ever since I was introduced to the superfood bowls in Hawaii last summer, I’ve been swapping in more smoothie bowls for my regular smoothie. Just as effortless as smoothies, with a lot more texture. Plus, hello gorgeous. Who doesn’t want to chow down when breakfast looks this colorful? This one is inspired by our New Zealand travels (documented here & here), a nod to the famous fruit in smoothie bowl form. Packed with protein and fiber , this breakfast will keep you full and satisfied for hours. Besides being more visually appealing, smoothie bowls have an added benefit over smoothies because you chew them. While regular smoothies can be packed with nutrients, we swallow them without much chewing involved. The chewing process, also known as mastication, is extremely important in your health and how mindfully you eat food. The longer you chew, the longer it takes to finish a meal which can help you eat less overall. Since it takes times (15-20 minutes) for your brain and stomach to recognize fullness, slower eaters consume 10-20% fewer calories as opposed to those who rush through a meal. 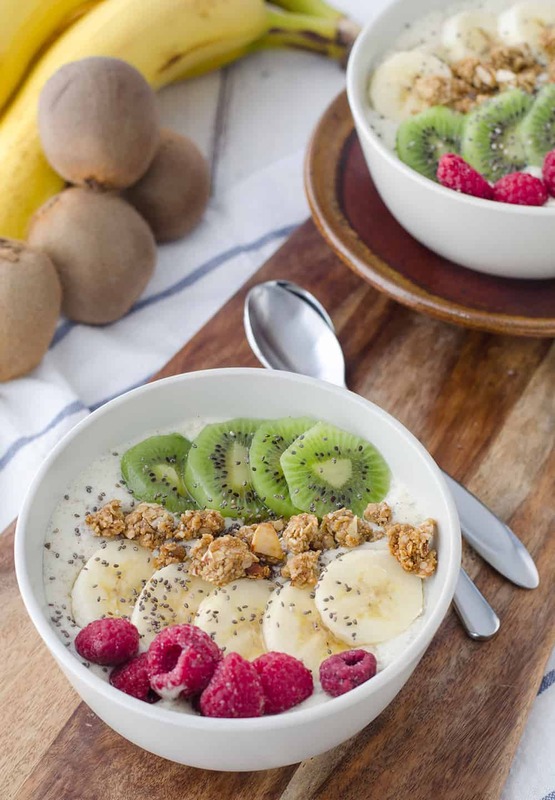 Smoothie bowls, especially like the one above, are packed with complex-carbohydrates, thanks to the addition of fruit and oat-based granola. The longer you chew, the more time your food has to be exposed to saliva, containing digestive enzymes that break down food and make digestion easier. Amylase, an enzyme that breaks down carbohydrates is the primary enzyme found in saliva. If you’re looking for a mindful way to being your day, consider swapping in a smoothie bowl for a smoothie! Chewing is not only beneficial to digestion, but it also helps increase satisfaction in a meal. When you take the time to properly chew, you are able to slow down, savor each bite and fully enjoy all the flavors your food has to offer. 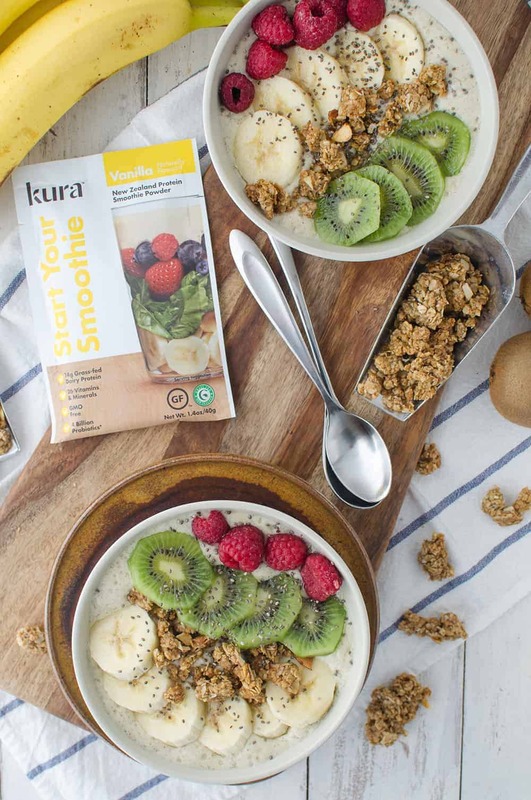 The base of this smoothie bowl is a vanilla-kiwi smoothie, made with frozen bananas, fresh kiwi and vanilla KURA protein powder. I was first introduced to KURA at the FNCE conference last Fall and loved it at first sip. 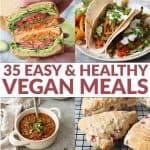 Being a RD and food blogger, I’ve tried hundreds of different protein powders. In my quest for the perfect powder, taste and nutrition are essential. I’ve tried many brands whose nutrition lived up to the hype, but the taste was barely palatable. I want my powder to be only slightly sweet, allowing me to mix and match flavors based on my morning preference. I also dislike any stevia aftertaste, a common ingredient in many designer smoothie powders. So, when KURA invited me to breakfast at FNCE, I was excited to try a product I’d heard so much about from other dietitians. The whey powder is sourced directly from New Zealand (❤️) with 26 vitamins and minerals, 4 billion probiotics, antioxidants and omega-3s. Thankfully, it also tastes delicious. This post is not sponsored, I just really love their products and wanted to share! The last (and possibly best!?) 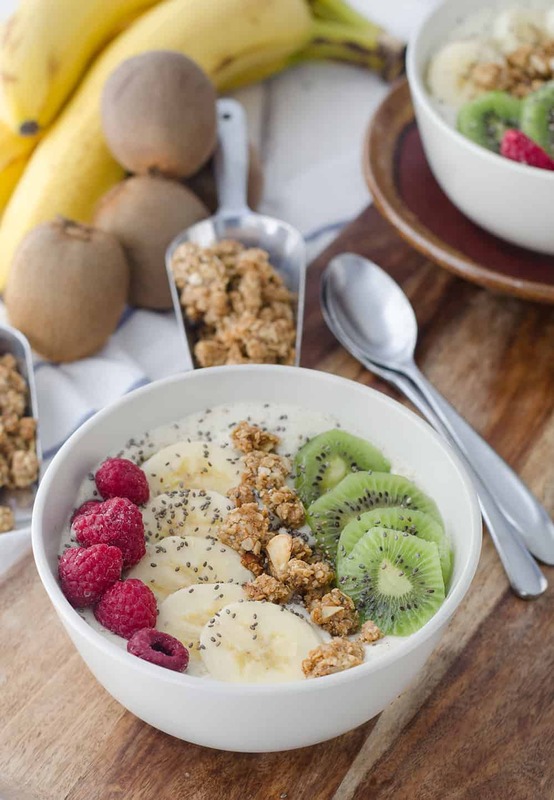 part of this New Zealand inspired smoothie bowl is the hokey pokey granola! Kiwi’s go absolutely nuts for this stuff. I’d never heard of it prior to our trip, but once we were there- I couldn’t get enough. Hokey pokey ice cream, chocolate covered hokey pokey, hokey pokey fudge, we ate it all. After researching more when we got home, I realized that hokey pokey is basically sugar. Fantastic. No wonder it was so delicious. While this isn’t the healthiest granola I’ve made (I use brown sugar instead of usual maple for a taste similar to toffee), it’s arguably the best. I don’t even want to mention how many batches BL and I have gone through over the past two weeks, the clusters are highly addictive and taste great on just about anything you can get your hands on. New Zealand Inspired Smoothie Bowls! 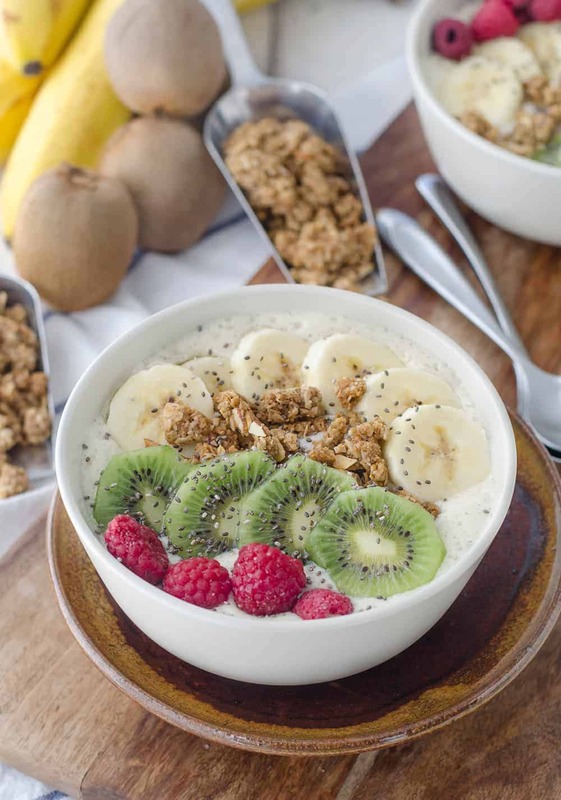 Kiwi Vanilla Smoothie Bowls topped with Hokey Pokey Granola. A healthy breakfast, packed with almost 20 grams of protein. Mix together the oats, crushed sliced almonds, flour, salt and cinnamon together. Add the butter in a medium saucepan and cook over low heat, stirring until melted. Add the brown sugar to the melted butter and whisk until well combined. Cook for another minute or two until the mixture starts to boil, taking care not to burn. Whisk in the molasses and malt syrup, then remove from heat. Stir in the vanilla. Add the melted sugar mixture to the dry ingredient and stir until well-combined. You want every bit of the oats to be coated in the sugar mixture. Place in a single layer on a baking sheet and bake for 15 minutes. Remove from oven, stir to flip and bake another 10 minutes until golden brown. Remove from oven and let cook; the clumps will form as the granola cools. Make the granola: Puree together the protein powder, kiwis, banana and unsweetened almond milk until creamy and smooth. Pour the smoothie into a bowl, then top with granola and additional toppings. I love this smoothie bowl! 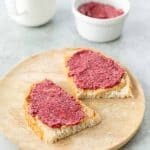 What an amazing idea for breakfast. Well this New Zealander is LOVING the look of this 🙂 Absolutely fantastic! !